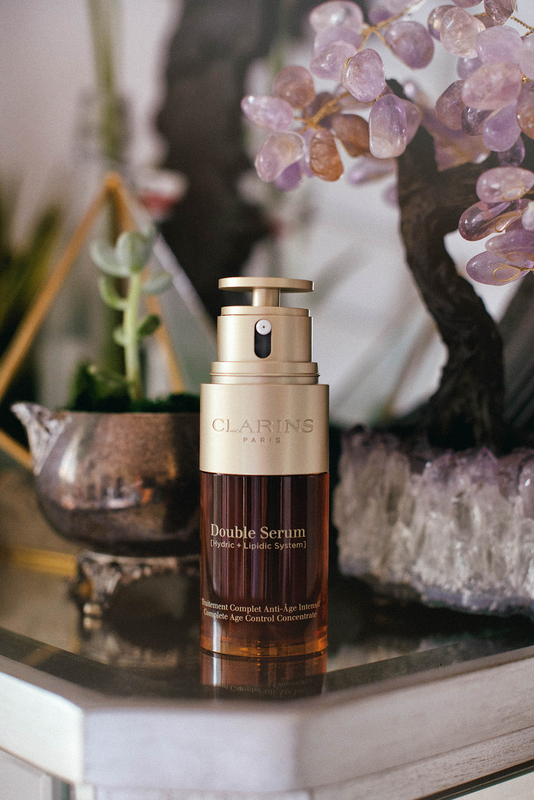 This time last year, I started using the Double Serum by Clarins and instantly fell in love! I am excited to share that after a year of consistent use, I still love it as much as I did on day one. 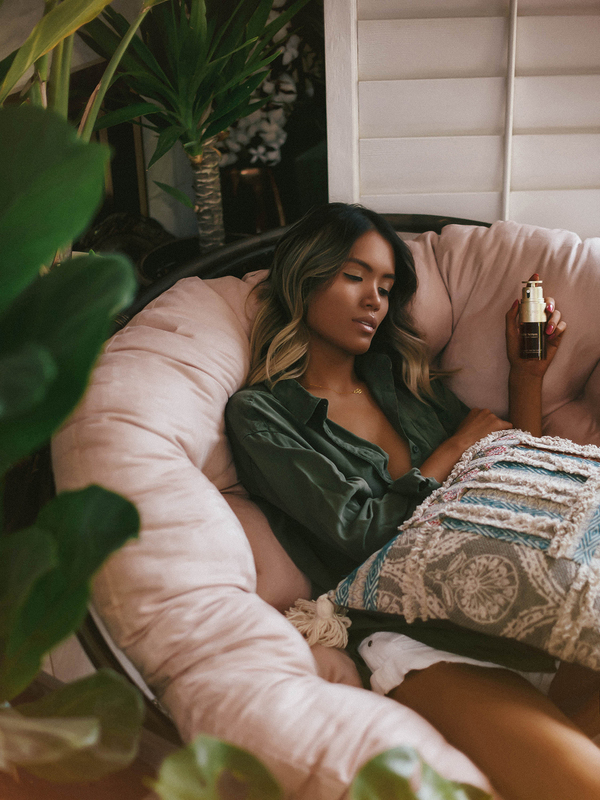 If you haven’t had the chance to try it yet, this holy grail is a two-in-one serum infused with turmeric extract and 20 other skin-loving plant ingredients. Turmeric’s anti-inflammatory and soothing properties make it beneficial for the body both inside and out. Needless to say, Double Serum is one of the best treats I’ve given my skin in my 20’s, and I know I’ll be using #MyDoubleSerum, my skincare hero, for many years to come. I can’t stress enough how important it is for me to have a solid skincare regimen because desert life can be so rough on my skin. Some days, we get extremely dry heat, while other days are awfully humid and gross. Obviously, you can’t control the weather, but you can elect to use quality beauty products to help fight aging, pollutions, and other signs of stress. 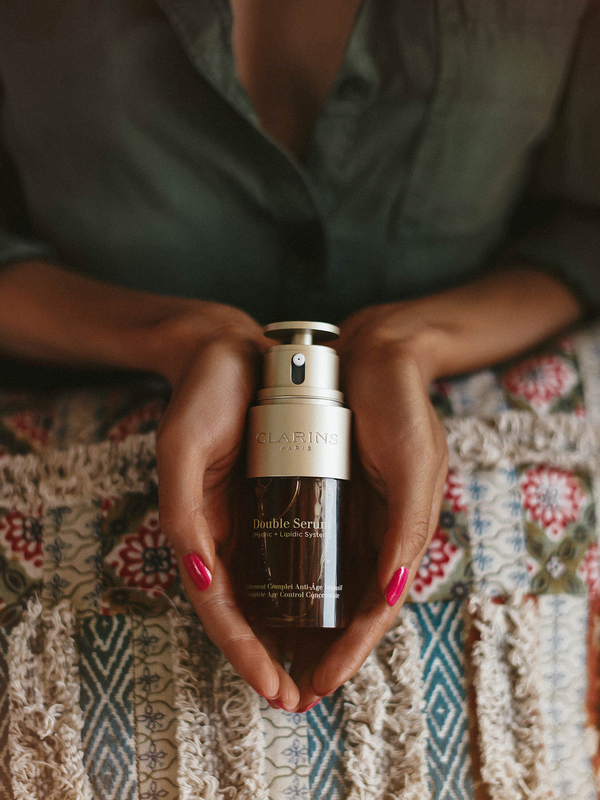 I love that the Double Serum does just that – all the while keeping my face and neck super hydrated, firm, and radiant. No matter what kind of harsh conditions I deal with in my day-to-day life, I can always count on this serum to protect and nourish my skin! One of the greatest things about this worldwide bestseller is that it’s ideal for just about all skin types, ages, and concerns. This is why I recommend it to so many of my friends and family members when they ask me how I keep my skin glowing year round! I am a sufferer of both oily and dry skin depending on climate, and sometimes I’m a little bit of both. Since my skin can be so inconsistent for sensitivity, having a serum that is suitable for all skin types is crucial. Double Serum is easy to use both morning and night, after cleansing and before moisturizing. Doing it this way maximizes results and makes the rest of my skincare routine work more efficiently. This serum comes with two dosage options – the power shot and the mini shot. The power shot is what I use when my skin is feeling either normal or dry, while the mini shot is perfect for days when my skin is feeling either in the middle or erring towards the oily side. You can easily adjust the dosage by turning the top of the nozzle prior to pumping. Application is a breeze. I simply rub my hands together to warm the serum, and then press it gently into my freshly cleansed face. I’ve found that it’s most effective to use a repetitive, circular motion, starting from the cheeks, to the forehead, and then the neck and décolleté. Are you one to thrive on instant gratification like I am? You’ll be pleased to learn that Double Serum delivers visible results after just 7 days. Of course, your skin will look and feel smoother, firmer, and more youthful with continued use. I’m speaking from experience using it for an entire year! So what are you waiting for? Get glowing with Clarins Double Serum! Your skin is so smooth! Sounds like this serum has helped a lot – I need to incorporate it into my beauty routine too. Thanks for sharing! Thanks Eileen! Yes, it has definitely helped a ton 🙂 I definitely recommend this serum! These photos are AMAZING. I don’t actually use Clarins because they aren’t Cruelty-Free — at least, not to my knowledge — but this is a truly lovely blog post! Not really into skincare at the moment but I just wanted to say that those pictures are absolutely gorgeous! Clarins is definitely a reliable, great beauty brand! I’ll have to check out this serum because I definitely am an instant gratification/ results girl haha. This product seems amazing! And results after 7 days? I’m in! I love it too! I think it’s so clever. Clarins has a great line of skincare products that I love! I would love to try this! Looks great, love the pics. I am a fan of Clarins Double Serum too! I love that it’s lightweight and doesn’t feel oily or thick upon application, even with the power shot. Great photos girl! Your skin glows, and you’re gorgeous. I think Clarins should make you a spokesperson. Lovely photos, also! this serum is one of my favorites too! So glad to hear that you like it too! I love a good serum! I’ll definitely have to try this one! Clarins products are amazing! A lil expensive but you can see and feel the difference in the skin almost instantly. I haven’t tried the double serum yet, but it’s on my to-buy list for sure. Your skin looks flawless! I’m definitely going to look into this! I’ve been hearing good things about Clarins for years. Thank you Marcie! You are so sweet. If you give this serum a try, I’d love to hear your thoughts on it. I’m sure you’ll like it! I LOVE your photos!! They are so beautiful! This also sounds amazing. Thank you so much for sharing this! Your blog post is truly lovely – it’s made me want to go try out the serum. I need to update my beauty routine and will consider this for sure. This serum sounds absolutely amazing. I’ve been on a skincare kick lately; will definitely have to try this one out! Thank you Julia! I’m in love with this serum! Sounds like a great product, I’ve never tried it. I’ll have to look into it more. Great photos too! This product sounds wonderful! I’ve been looking for something to help me with my dry skin. Yes! This serum literally saves me in the winter when I have dry, flaky skin. I have been using Clarins Double Serum and it has really a great effect on my skin. I introduce this to my friend and they love it so much. I have never tried to use any serum from my skin but this one looks like a great product to use, I will definitely check this out. Ahhh having a good serum makes a world of a difference when it come to skincare for me! Definitely recommend this one babe! I heard a lot of good things about this brand but never tried to use this. I will check this out and will try to use this to see the effects from my skin. You might be hooked like I am once you give it a try! The results are visible so quickly which is nice! I definitely have to check this product out! I’ve been on a hunt for a quality product for my skin since it can be sensitive. Thanks for the recommendation! Wow! I am glad you had such amazing results. It is a pretty pricy product so I am glad there are visable results in 7 days. I don’t like to be too frugal when it comes to skincare, so I think this miracle-in-a-bottle is worth every penny, considering the results it gives me. Highly recommend if you’re looking for a good serum to add into your skincare routine! This is by far my go-to serum, I love that you can control the amount of product dispensed, not to mention it works like a charm! YES! Me too! You couldn’t have said it any better. So glad to hear that you’re a fan too, Kelly! I love that you shared this! Plenty of people talk about a skincare product when they first try it, but it’s just as important to hear about if they keep using and still like it! Thanks for sharing. I totally agree with that! This is definitely a product that will be staying with me for the long-haul as far as skin care goes. Such a lifesaver! Never knew how important serums were until I gave this one a try. These photos are so gorgeous! I haven’t heard of this serum before but it sounds amazing so I may have to try it out. Thanks Ellie! Glad you like the photos. Let me know how you like the serum if you get a chance to try it out! This product certainly sounds like an investment worth making! I constantly hear incredible things about Clarins and their different product options. One day I’ll have to treat myself to one of them! Clarins definitely has a wide range of both skincare and makeup products, which I love. This serum is one of my faves from their skincare line. Definitely lives up to its hype and I recommend it to everyone, no matter the skin type! Yes it is, babe! I have no doubts that you’ll love this serum and be inclined to try other Clarins products as well. I am a fan of their lip oils too. I live in the desert, too. I’m always struggling to find skincare that I love. The fact that you still like the product after a year is great! Clarin’s is my favorite, I use their matte face power, it is amazing. Ooohhh I have yet to try that one! I love a matte finish so will have to give it a try. Thanks for your recommendation, Evelyn! Clarins has been one of my go to skincare brands for years! I have to get my hands on this serum! So happy to hear that babe! I am a fan myself too and can see myself using this serum for many years to come, along with some of their other products that I love too like their comfort lip oils! Clarins products have an excellent worldwide reputation. I’m confident this serum is an excellent product. Looks like the serum is working well for you! I’ve been on the hunt for a good serum, thanks for your honest review. This looks like a great serum, and you have such gorgeous skin! Thank you so much for sharing. I need to try this! I’ve been using the Double Serum as well for the past month and was very pleased with the results I saw! The consistency seemed very thick to me when applying, but the product absorbed really quickly into my skin, which I appreciated it. This product felt so luxurious on my skin and I’m stoked to continue using it for the cooler months when my skin gets much drier. Yes! Gotta love a serum that absorbs quickly and leaves no icky residue haha 🙂 Glad that the serum is working out well for you too! After a certain point in your life you stop skin care because of rough schedules. This article is definitely making want to pamper myself a little. Wow, makes your skin looks flawless! Dying to try this product thanks for writing this! That sounds amazing! I want to try this out! I love Clarins products in general! I have never heard of or used this product, but it obviously is working wonderfully for you. I was about to comment on how lovely you look in your photos and was going to suggest you could model for this company. Then I looked at your About page and found out you are a model, or have been! 🙂 Not a surprise at all. I’ve heard so many great things about this serum! I definitely want to give it a try. I’m all about having a good skincare routine too. Good for you darling! A solid skincare regimen is so important. This serum definitely lives up to its hype! They are such a great brand, I use the same serum and i’m In love with it. Over all your skin looks beautiful. I know right? It’s one of the beauty products that I’ve stayed consistent with, and it’s totally paying off!